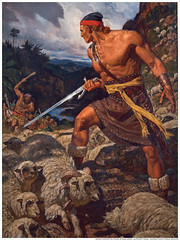 The Story of the tremendous missionary work that was performed by Aaron, Ammon, Omner and Himni among the Lamanites is an awe inspiring story. The account of their mission is a powerful one. All in all, they spent 14 years teaching the Lamanites, and if you collectively add their experience together, their experience totalled 56 years. What a marvelous sacrifice. But their story did not begin there! Their miraculous story mirrors (In many ways) the Biblical story of Saul. President Uchtdorf explained the story of Saul well in his talk “Waiting On The Road To Damascus“, but here is a tidbit of the story in which I will relate to Alma, Ammon, Aaron, Omner and Himni. Saul was so hostile that many members of the early Church fled Jerusalem in the hope of escaping his anger. I know this is a tremendous amount of information to use in the attempt to build-up to the title of this blog entry, but I believe it to be significant. Ultimately, both stories produced changes in the individuals that were of significant magnitude. When Alma was about attempting to destroy both the people and the church of the Lord, it was 92 B.C. After the encounter with the angel they immediately set to work repairing all the local damage they had done, both temporally and spiritually. So now that you know the context of the past that Saul, and the past of Alma and the sons of Mosiah (Ammon, Aaron, Omner & Himni), you know the significance of the future impact they would all make. What I found most interesting, was how they started their missionary work. Alma and the sons of Mosiah were given a second chance by the Lord, and it clearly became apparent to me that they wanted the Lord to see just how thankful they were for that great blessing that we as members of the church can experience, repentance. They were set in their minds to do all they could to bring others to the truth, and so much so that they were willing to brave the probability of death by preaching to their brethren the Lamanites. It saddens me frequently that I have taken the gospel for granted that much. Are we all at that point? Do we all appreciate just how important the gospel is to us, and just how important we should hold it, with reverence in our hearts, about how much we should share it with others? I know I have failed at being as good of a missionary as I could be. Some of the choices we have all made have had us question our legitimacy of sharing the gospel, but one thing is certain brethren, the gospel is perfect, and man is not. We can start to make commitments to be better representatives of the gospel, and we take it one day at a time. Start by studying the gospel every day, and we will be amazed at the progress that will be made. “…That Lamoni may retain his kingdom, and that ye be not displeased with him, but grant that he may do according to his own desires in whatsoever thing he thinketh, then will I spare thee;” (Alma 20:24) This I found was quite interesting, and the king later found it interesting enough that he even spoke of it and how it showed the good intentions of Ammon. We were literally reading just how good service from willing Missionaries (both Ammon and Aaron), the good intentions of their hearts, and their desire to keep the commandments of the Lord could be deciding factors in helping others to have a desire to come to know the truthfulness of the gospel. In our own way, we all have some influence upon friends, neighbors, co-workers and other walks of life and will find that our living of the gospel, in all righteousness, our friends may have a desire to see us. The Lord will guide us in, to know just when to reach out to another. May we all take the lesson that Aaron and Ammon have taught us, to be good examples- leading others to Christ– deep to heart, praying for an opportunity to be an instrument in the hand of the Lord. We all have had an experience, certainly at least once, where we have reviewed in our scripture study something that jumps out to us in which we know we have read it yet don’t recall it being so significant to us prior to the time of your recent discovery. I have now had a few experiences in the past two days where this is so. Ponder that for a moment, then read below. As leaders in the Church, with respect to no calling, we all are certainly aware of our duties and the significance of the stewardship we have in magnifying these callings. As I pondered my responsibilities, the responsibility of an Elders Quorum president, I then had opened my scriptures and read the seventh chapter of Moroni, thus stumbling on this scripture. I was intrigued by the manner in which Mormon was addressing his son Moroni, and other individuals in his writing. First, pay close attention to him first being able to talk to them “by the grace of God the Father, and our Lord…”. What a humbling reminder of the meekness he has is attributing the significance of his ability to talk to them by first giving credit to both the Father and the Son. Next he says why he is then addressing them, when he says, “…[because] his holy will.” He opens the authoritative window of his responsibility, and also here shows that his desire is to do the will and commandment of the Lord in speaking to the Nephites. He then reveals how he addresses us when he says, “… because of the gift of his calling unto me.” This portion is what caught my attention. Never before do I recall reading this, or certainly talk of it. In fact, I never considered I should address the magnifying of my Priesthood calling as “…the gift.” I know why now, yet still reflect on its significance. This is an authoritative injunction to see and realize it is not just work to be done because of the known duties each of us should be mindful of, but this also teaches us that we should be greatful to have the chance to serve in this capacity. For as we do serve in this capacity, we learn skills and are taught them in a manner which can be done in no other way except through the Holy Ghost. I pray now, within myself that I will forever review my calling in the manner in which Mormon did. He teaches plainly the significance, and I pray we all remember the meaning of this. November 7th Daylight saving ends. Clocks back by one hour.